ManCan Mini Keg Growler (Stainless Steel) - 64 oz. 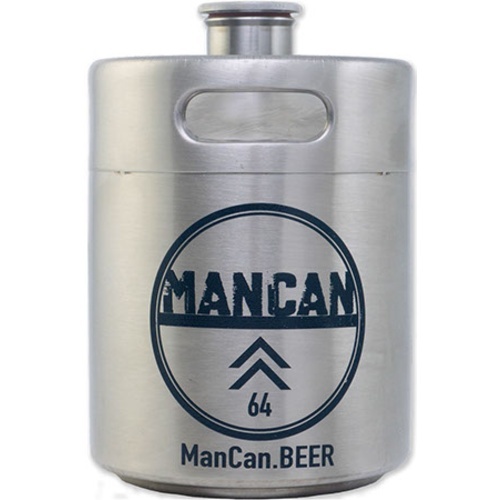 The ManCan stainless steel growler is an indesctructible 64 oz, patent pending mini keg design that will keep your beers fresh and carbonated. 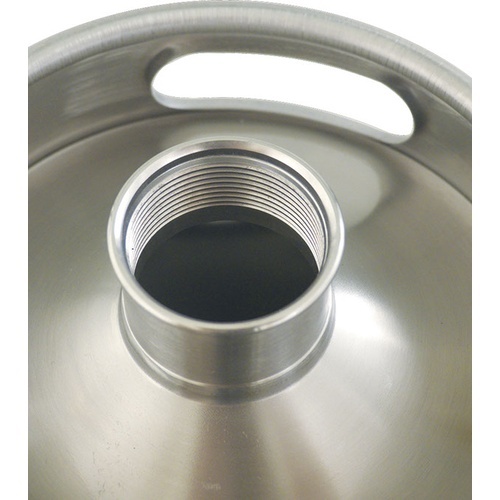 Made from stainless steel ManCan's are made to the highest quality standards in the industry. The unique threaded lid removes for easy filling and cleaning. ManCan also has tapping systems that will thread in for a true on the go experience. Holds 1/2 gallon (1.9 Liters) of beer and is made from stainless steel. Gasketed screw top lid seals tight. Won't break like glass might. Use our Faucet Growler Filler attachment (see below) for a foam-free fill! Comments were good, was what I wanted, good price. What are the dimensions of the 64oz ManCan? What is the Outside Diameter? What thread is the cap? - Diameter of threads and threads per inch? Do you sell a cap that already has holes in it that is not part of a kit? BEST ANSWER: GL600 Has an Outside Diameter of 5 1/4" and a Height of 7 3/4" (with cap). It is very typical for something like this to have proprietary threads, exclusive to this application. We do not offer aftermarket caps for this product, it seems to be made of sturdy Stainless Steel. With the right bit, and drill press, you might be able to get through it. This thing is great has a rubber gasket that keeps your beer fresh. Great for filling a session beer and taking it to the beach where glass is illegal. I haven't tried to fill it with commercial beer yet. Only real downside is that it is harder to fill, as you can't see the fill level, and (if you don't have a growler filling tube attached to your faucet) you can't fill down the side of the growler as you can with other growlers. Its nice to bring it with me in the car and not have to worry about glass breaking and spilling all over, and its got a great look. The lid's o-ring keeps it leak free. Other review comments I agree with: 1) it looks smaller than it is!, and 2) its less natural to pour from into a pint glass because of the opening's position. Minor issues to me, but worth mentioning. I've brought this growler to several parties since purchase and it consistently gets questions and, that's cool remakes. As a growler, it is nice that it isn't glass. The threads are a bit grippy, so be careful with recapping and a must admit, the cap was misplaced more than once. My wife got this for me for Christmas, and I love it been to a few breweries and got it filled. Love it. A lot of inquiries from other people. These are the best growlers made! Good for filling and for homebrew! This is one of the nicest and rarest growlers I have ever seen. Definitely a conversation starter whenever I take it somewhere. This is a great growler. It looks much smaller than it is. The first time I had it filled at a brewery they were only going to charge me for a quart. They were about to dump it out and measure because they didn't believe it when I said it held a half gallon. It's not the easiest growler to pour from but the cool factor trumps everything. The only negative so far is that one brewery I went to wouldn't fill it for me because it doesn't have the required government warning label on it. Oh well. I just printed and added my own label. Took the wording from another growler. Overall theses are great. 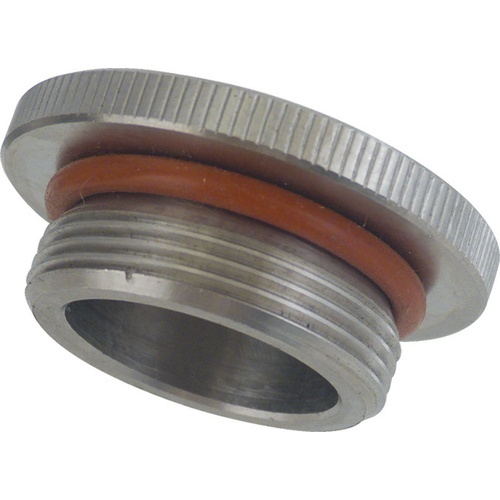 The manufacturer sells a cap with a gas post for these, but with no relief valve you must be cautious as it will explode. If you are just using as a standard growler you will really enjoy theses. Awesome product! Bought one several months ago and it is awesome! Always gets questions at the tap room. Upstream brewing in Omaha wouldn't fill it though, troubling... They told me they would be happy to sell me one of their growlers, but wouldn't fill the three I brought with me. No worries though, everyone else will fill my mini keg no problem! Is it difficult to pour? It seems like holding the glass in one hand while pouring the growler with the other might be awkward because of the growler's shape.